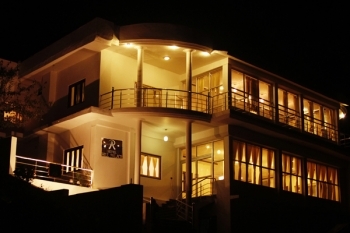 The Hill Palace is a boutique hotel located in the heart of Kausani, overlooking the Nanda Devi Mountain ranges. Guest will discover a sleek, sophisticated 3 star amenity hotel in Kausani, which is newly built in the Kumauni hills, with a location perfectly suited for family holidays and honeymooners, eminently stylish and contemporary enough to please the most discerning of holiday guests. Hill Palace hotel in Kausani is located near Tea Garden of Kausani, and all the Kausani tourist places are easily accessible from here. 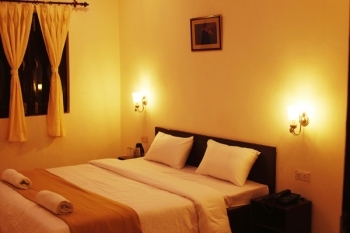 There are 18 deluxe rooms and 6 Himalayan and snow view rooms in Hill Palace hotel. Every room has been furnished in individual styles whilst ensuring comfort, privacy and luxury. The large windows from Himalayan view rooms invite guests to experience comfortable elegance and majestic views of the surrounding mountains. Hotel Hill Palace in Kausnai have a multi cuisine restaurant which serves a variety of dishes, from Indian, Chinese & Mughlai & local specialties. The restaurant serves Ala Carte & buffet meals depending on client’s preferences. The restaurant is located on the 2nd floor with large pane windows overlooking the mountains, a fresh start of the day with the most beautiful surroundings is always a good idea. - Resort cannot be held responsible for any miss happening/damage/injury/loss of life during any outdoor adventure/activity or during transit before check in or after check out. - All extra services, other than the above inclusions are chargeable as per resort’s rate card. - Hotel/Resort's management has sole discretion to change/amend/alter the above rates without notice, during long weekends/festive periods/New year/Christmas period etc.